1993 Enactment of the Law "On the State Border of the Republic of Kazakhstan"
10 years ago in Petropavlovsk the North Kazakhstan area the President of Kazakhstan opened the memorable bas-relief for Shokan Valikhanov and Fyodor Dostoyevsky. Manufacture of a bas-relief was entrusted to the honored architect of Kazakhstan, the member of the Union of artists of the Republic of Kazakhstan to the associate professor of a sculpture Azat Boyarlin. The bas-relief was made in Astana by the LLP "Art and production workshops "Oner". Its sizes: height is 1,5 meters, width is 2,5 meters. The sculptural part of a bas-relief is made of bronze weighing 500 kg, text part — of granite weighing 400 kg. 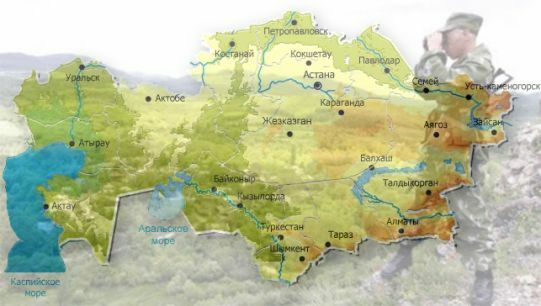 Enactment of the Law "On the State Border of the Republic of Kazakhstan"
President Nursultan Nazarbayev signed the Law "On the State Border of the Republic of Kazakhstan" aimed at regulating relations in the field of protection of the state border. The main aim of the law is to improve the legislation on the state border, as well as to separate the powers and functions of public authorities in this area. This document combined the laws “On State Border of the Republic of Kazakhstan” and "On the Border Service of the National Security Committee of the Republic of Kazakhstan" into a single law. Created a glossary that provides definitions of such concepts as "border security", "border incident", "categorization of the state border". The law determines the conditions and limits of application by the competent authorities of Kazakhstan of weapons and military equipment, special equipment for tasks to protect and conserve the state border. In addition, it was decided to establish the State Border Commission as a part of the Government in order to develop the proposals for the formation of border policy. It is expected to form a coordinating council as a part of the Akimats of border regions in order to promptly address the issues of border security.